When it came to this redesign, the bar was set very high for the Ford designers as they tried to retain the essence of the Mustang brand while providing a clear step forward. For the most part the new design meets that standard as the new Mustang is a beautiful sports car that fits the spirit of the brand. My test model had a unique orange exterior with a dark interior and black rims. Frankly the rims were my favorite part of the look of the Mustang. My only complaint involves the front headlights. While they look great with the new front end, by flaring up on the edges and opposed to angling down like the classic Mustangs of the past, the new vehicle loses one of the identifying characteristics of the Mustang look. This is more than made up for with the impressive fastback design and how all the design elements work together. The three-dimensional, tri-bar tail lamps with sequential turn signals really stand out. As for the headlights, it will be interesting to see how they evolve as this generation of the Mustang progresses through model years. I love the interior of the new Mustang. It’s comfortable and modern but retains the feel of a classic sports car brand. The leather-trimmed seats with six-way power control and heat/cool options make for a nice cockpit feel. I like the look of the gauges and the layout of all the instruments and knobs. All new Mustangs have push-button start and the model I drove had a rear-view camera. 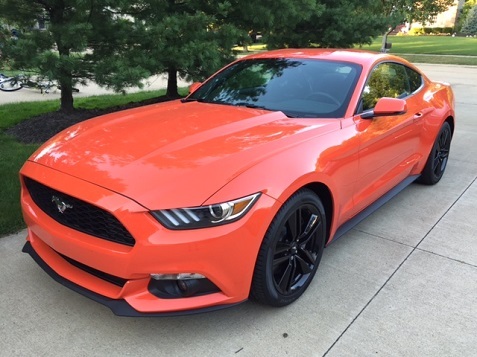 The Mustang offers maximum flexibility for consumers with the option of four-, six- and eight-cylinder engines that each produce at least 300 horsepower. These include a 3.7-liter V6 and upgraded 5.0-liter V8 for those seeking serious power. I tested the all-new 2.3-liter EcoBoost engine with a six-speed manual transmission that offers solid fuel mileage at 22 MPG city, 31 MPG highway and 26 MPG combined. Even with the smaller engine the Mustang delivered some impressive power and acceleration, particularly in Sport mode. The new EcoBoost engine uses direct injection, variable cam timing and turbocharging to deliver plenty of usable performance across a broad RPM range delivering 310 horsepower and 320 lb.-ft. of torque. The Mustang features all-new front and rear suspension systems. 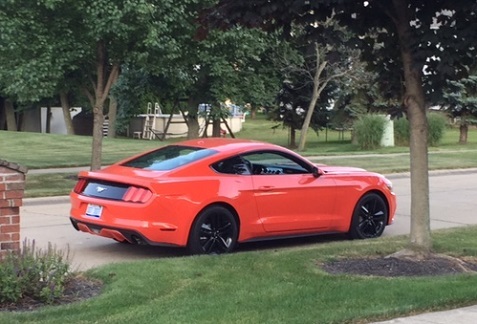 I had the new Mustang for a week and drove it in all kinds of setting including some fun country roads. It’s as fun as it looks. The revival of the Mustang has been very important for the Ford brand, and the pressure had to be great to follow the retro design with another hit. After driving it for a week it was pretty obvious that Ford met the challenge again. With all the choices in terms of engines and trim levels you’re bound to find one that fits your lifestyle and budget well.